A lot of rumour has been released in the past some days about the upcoming Pixel 3 and Pixel 3 XL and up till now more leaks are still coming out. In one of our recent post, we made you know that Google sent an invitation out for the upcoming event confirming 9th October as the deal day. We also brought to you guys about the recent page launched showing off the three colour variants that Google likely to come up with and some other nice features. 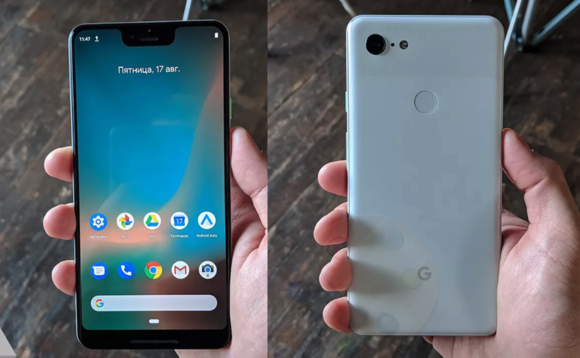 Another leak has revealed Google Pixel 3 and Pixel 3 XL photo showing back and front view but we couldn't determine all it features by the images. Pixel 3 XL is confirm to be bigger than Pixel 3 with notch function. Pixel 3 Xl is powered by Snapdragon 845 and talking about it camera its really cute with it single-lens rear setup. Nothing has been revealed about it price up till now but judging with the Pixel 2 and Pixel 2 XL it should be around £629 and £799 SIM-free respectively. Taking a recall, Pixel 3 and Pixel 3 XL will be officially announce in an upcoming event on 9th October. So for as many waiting fans we get it on sale soon.